"Despite its palette of talented artists, "Flowers at the Scene" finally turns out to be a monochrome album." 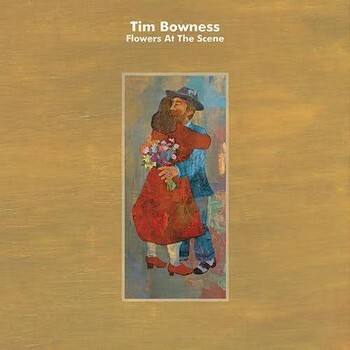 While Tim Bowness officially began his solo career in 2004 with "My Hotel Year", it really took shape ten years later with the excellent "Abandoned Dancehall Dreams". Since then, the British singer has returned every 12/18 months with an album under his arm, as is the case at the beginning of 2019 with "Flowers at the Scene". According to the artist's admission, "Lost in the Ghost Light" (2017) ended a trilogy begun with "Abandonned Dancehall Dreams" and "Flowers at the Scene" is an artistic renewal. A renewal that has its roots in the past. In 2018, Plenty's first album was released, a group formed in 1986 that included Tim Bowness. The album features 30-year-old compositions re-recorded for the occasion. Enchanted by the experience, Tim Bowness continues to build on his success by writing with Brian Hulse, another member of Plenty, many of the songs on this new album, seeking to recreate the atmosphere of the 80s while at the same time humanizing it. A symbol of this announced renewal, the recurring companions of the last three albums have been replaced by a plethora of new faces. Only Colin Edwin (Porcupine Tree) remains from the previous team, alongside prestigious guests including Peter Hammill (Van Der Graaf Generator), Andy Partridge (XTC), Kevin Godley (10CC), Jim Matheos (Fates Warning/OSI) and David Longdon (Big Big Big Train) to name only the most famous. Not to mention Steven Wilson who, apart from his anecdotal participation in the synthesizers, officiates behind the mixing desk and Brian Hulse who co-produces the record and plays the role of one-man orchestra. With such a line-up and such great ambitions, how can we not hope, if it is not a masterpiece, at least a great record ? Unfortunately, the promised evolution/revolution doesn't really happen : without being a bad record, "Flowers at the Scene" doesn't offer anything really new, perhaps because of a very characteristic vocal imprint (this way of singing by whispering that only belongs to Tim Bowness) but a little monotonous that masks the relative diversity of the music. The eleven tracks on the album are all rather mellow and common ballads, pleasant to listen to but which do not leave any lasting memories. In terms of success,'I Go Deeper' is a rather dynamic beginning, 'Rainmark' draws attention with its sad trumpet, sharp guitar solo and rain-like arpeggios, 'It's the World' gives a sense of urgency, unease, violence and strangeness, and the sound of the synthesizers and drums evokes the Germans of Kraftwerk on the ghostly 'Ghostlike' (composed in the 1980s, perhaps explaining this). The rest can be listened to without displeasure but without surprise. Despite its palette of talented artists, "Flowers at the Scene" finally turns out to be a monochrome album. Despite its palette of talented artists, "Flowers at the Scene" finally turns out to be a monochrome album.